Geoffrey K. Fleming. Ever Eastward: Alfred H. Cosden and His Estate at Southold. Southold: Southold Historical Society, 2010. Pp. 59. Photographs, bibliographic references. $24.99. Geoffrey K. Fleming’s book Ever Eastward is a delightful account of the history of Alfred Costen’s estate in Southold. The inclusion of “Eastward” in the name Cosden chose for his expansive property, which included a golf course, was appropriate because his palatial home, high above Long Island Sound, was located at the eastern end of Soundview Avenue. This section of the road, which is a designated scenic byway, was dotted with mansions erected by members of Brooklyn and New York City’s wealthy elite. In a sense, it was a sort of Gold Coast East because the homes along Soundview Avenue, while few in number, compared favorably with those inside Nassau County’s more famous real estate paradise. That Cosden chose the remote eastern part of Suffolk County rather than a locale farther west is not surprising because his family had summered in a rented house in Southold and had developed a fondness for the community. To Cosden, who had retired from the pharmaceutical business at the age of forty-two, it seemed the ideal place to raise a family. His own childhood had been spent on a farm in Delaware but, as author Geoff Fleming points out in his succinct but fact-filled account of Cosden’s life, at age twenty he left for Dover to apprentice at a drug firm. Two years later he relocated to Manhattan where he studied at the New York School of Pharmacy and worked his way up in the William B. Riker drug chain. Following a series of mergers and acquisitions, Cosden became president of the firm. In 1915, the company was the target of a successful takeover bid and at this point, Cosden retired. By then he had decided to build a permanent home in Southold for his wife and two young sons. A third son, the eldest, had died at age four in 1913 and the family selected the Old Burying Ground adjacent to the Southold Presbyterian Church for his final resting place. They built an imposing mausoleum there, where other family members would eventually be interred. The cemetery was just a few miles south of Cosden’s new Georgian Revival home. 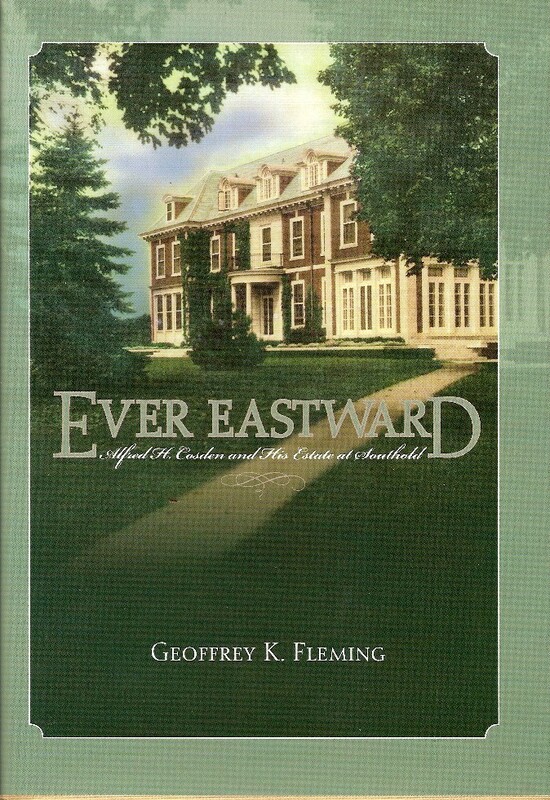 In the “Home and Family” section of this superbly illustrated book, Geoff Fleming provides readers with a detailed account of the estate’s development beginning with the architectural firm of Burley and Visscher, which was responsible for the design of the grounds as well as the buildings. The centerpiece of the estate was a brick and stone mansion with a blue slate roof. Complementing Fleming’s precise verbal portrait of the mansion, right down to the furnishings, are the pictures he has chosen. Gazing at the illustration of the spacious columned porch, complete with cushioned wicker furniture, on the west side of the house, one can almost feel the breezes from Long Island Sound. A picture of the staircase leading from the rear of the house to the Sound beach is a reminder of the height of the bluff atop which the house perched. All of the illustrations, including those of the still extant main gates, stable complex and two staff cottages, have nicely detailed captions. In the “Life in Southold” section, one reads about Loraine Cosden’s picnics on the beach for her female friends in the Tuesday Club, her fundraising activities for North Fork institutions and the happy days the Cosdens’ daughter, Carol, who was born in 1918, spent in the Southold public schools. At the same time one gets to experience all of this vicariously through the well chosen pictures, including one of Carol Cosden in riding attire. Horses were such an important part of life at the estate that Fleming devotes an entire section to them. He points out that while Cosden was living in New York City he not only owned trotting horses but was a director of the New York Driving Club. Some of Cosden’s horses won major competitions. In 1917, his “Real Lady” was the fastest trotter in the world. Cosden remained active in racing until the late 1930s. Just as horses faded into history for him, so, too, did Southold. Angered by the town’s efforts to obtain more tax revenue from its wealthy residents, Cosden threatened to raze his magnificent home and sell off the property, including the private golf course. When Southold officials refused to back down, the fortress-like house occupying the bluff overlooking the Sound for a quarter century fell to the wrecking ball. The surrounding property was sold and the Cosdens moved to a spacious apartment in Manhattan but, as Fleming states in the epilogue of this splendid book, “the Cosden family are not forgotten.” Thanks to this wonderful volume they will indeed be long remembered.